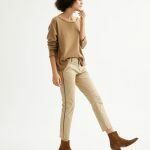 It’ll be a good month or so (at least) before the weather starts truly to cooperate with my desire to dress in bright, spring-y tones, although over the weekend, we got some glimpses of what life will be like when it’s nicer out again here in New York. 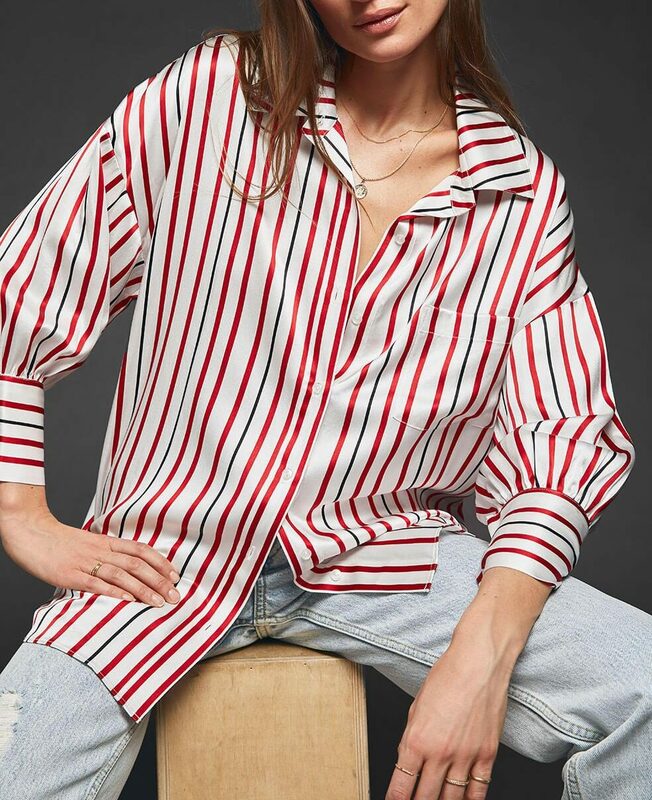 I, for one, can not wait to wear pieces like this crisp silk red and black striped button-down. I’d never think of combining a pastel like lavender with bright orange, but on this sweater, it really works. 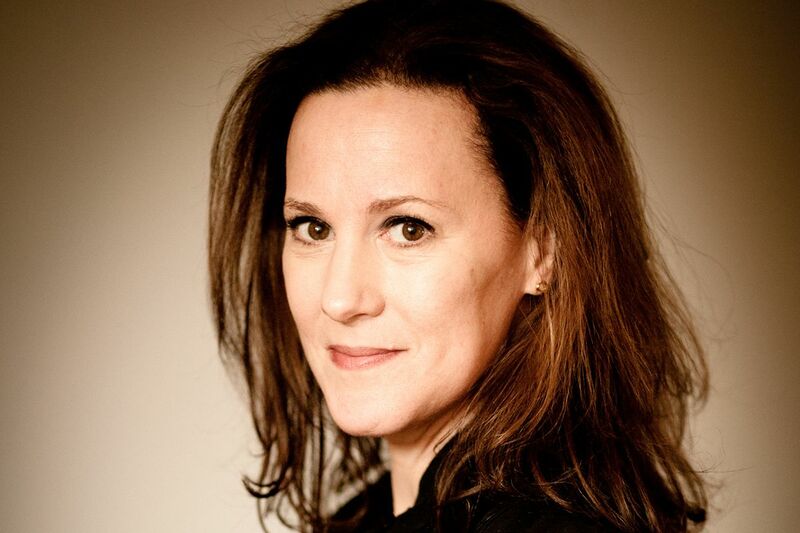 A fun blazer that feels ever-so-slightly English schoolboy. 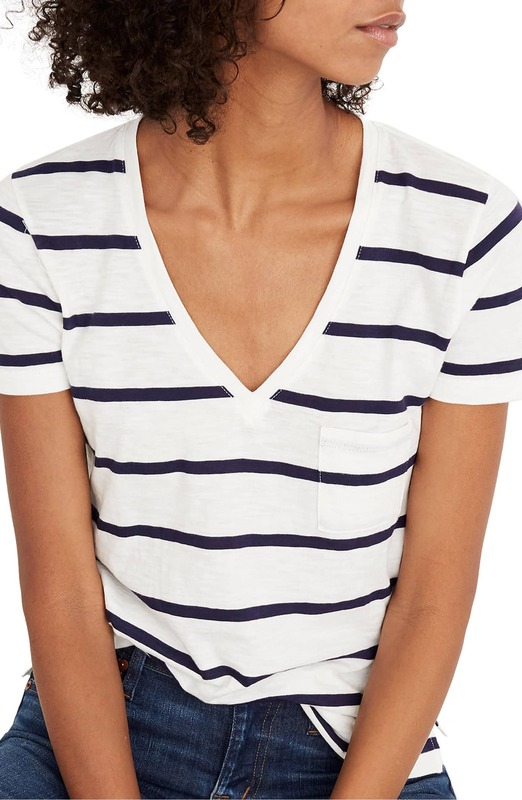 A simple pocket tee at a nice price. 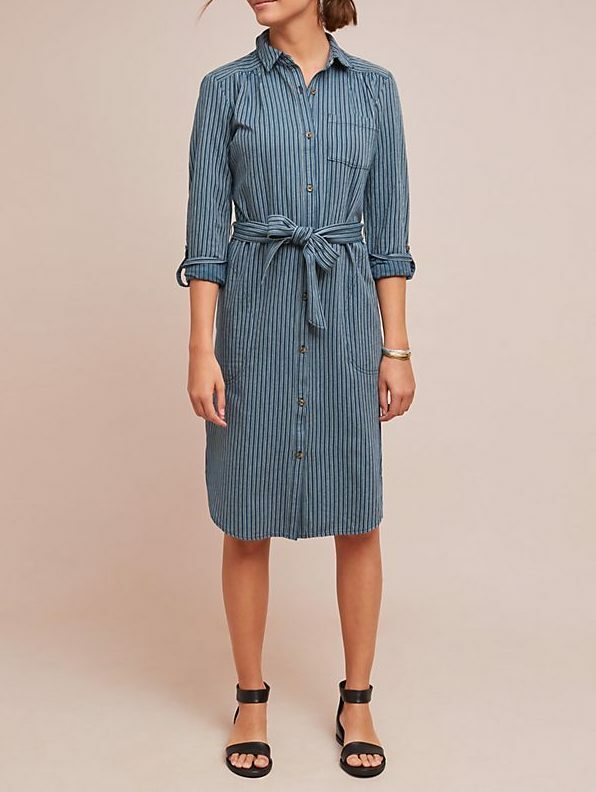 A shirtdress that is slightly utilitarian in feel. 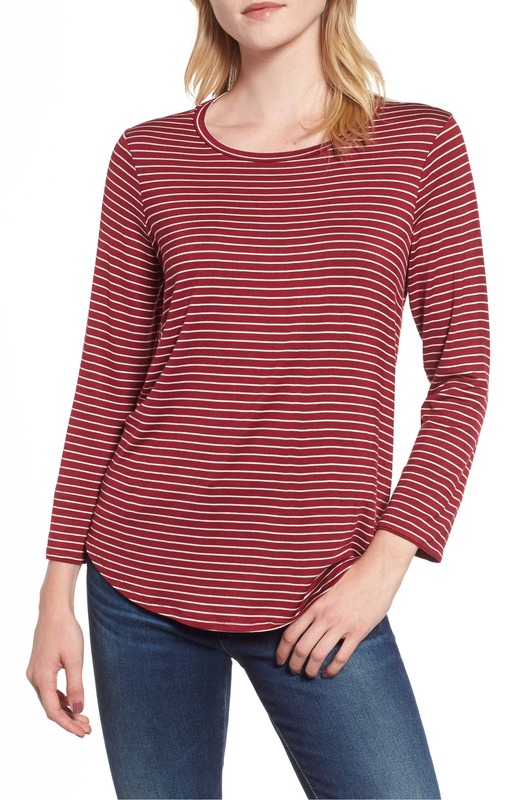 This is just a really good red striped tee that I can see wearing under a V-neck sweater now, and with cropped jeans or a skirt later on. 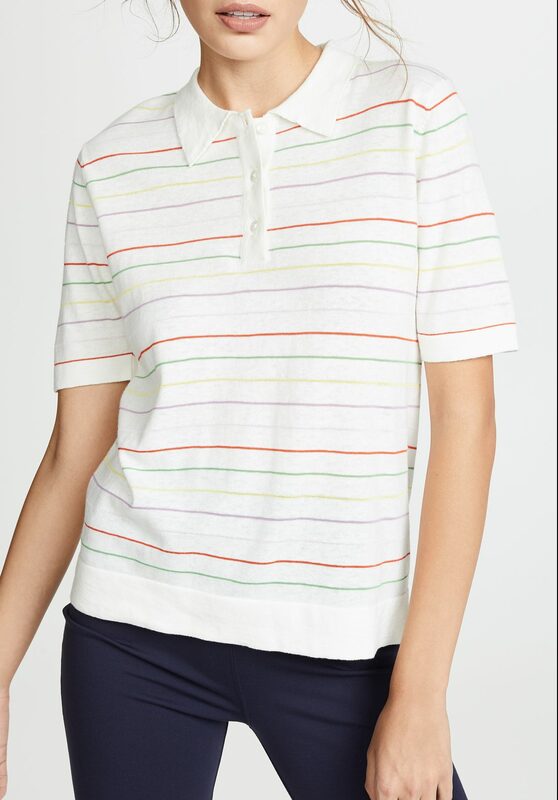 I do love a slouchy polo shirt—so preppy-cool—and the rainbow stripes here are subtle but statement-y. 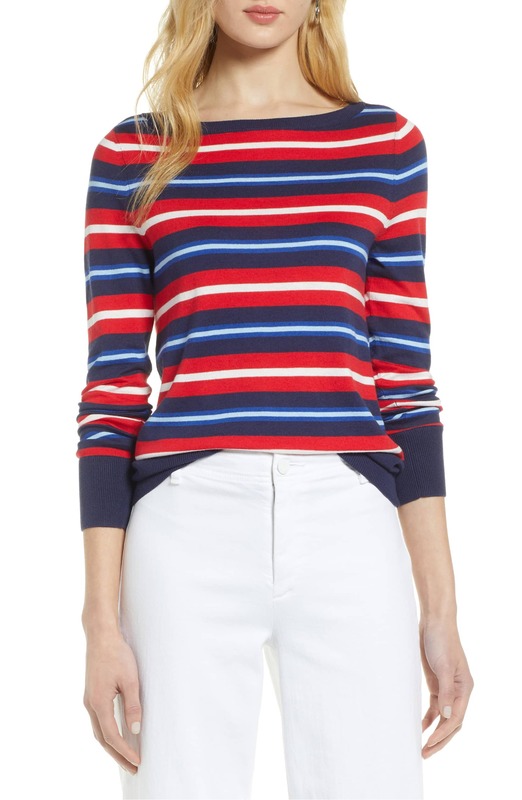 And I’m a complete sucker for a red, white, and blue sweater. 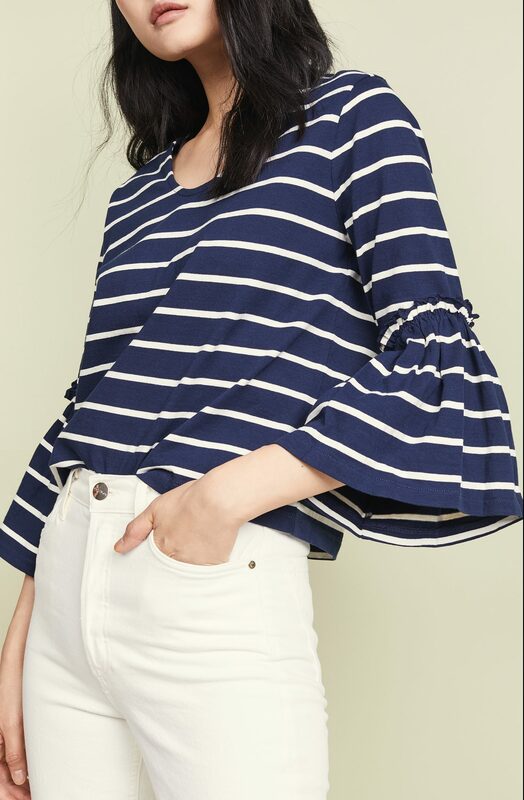 The ruffle sleeve on this top is unexpected and feminine. A flattering, poppy skirt that’s dirt cheap. 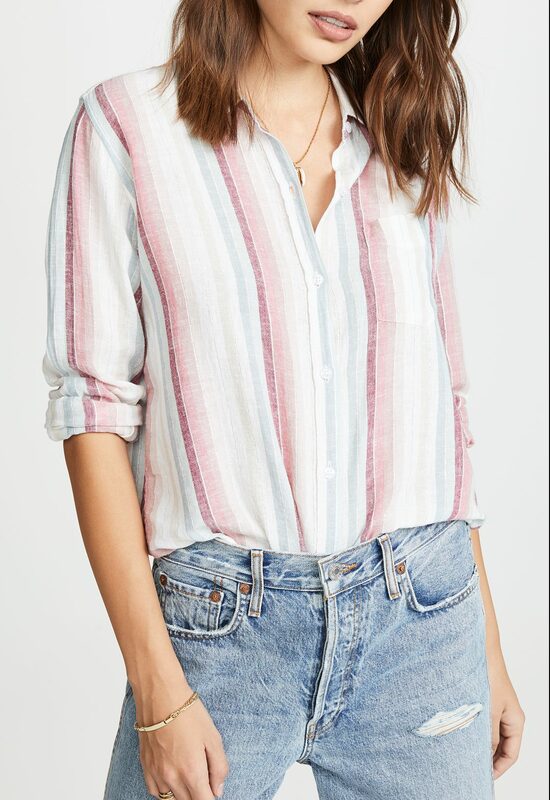 The faded-out stripes on this top give it a vintage vibe. This top reminds me of pricier ones by the brand Ace & Jig. 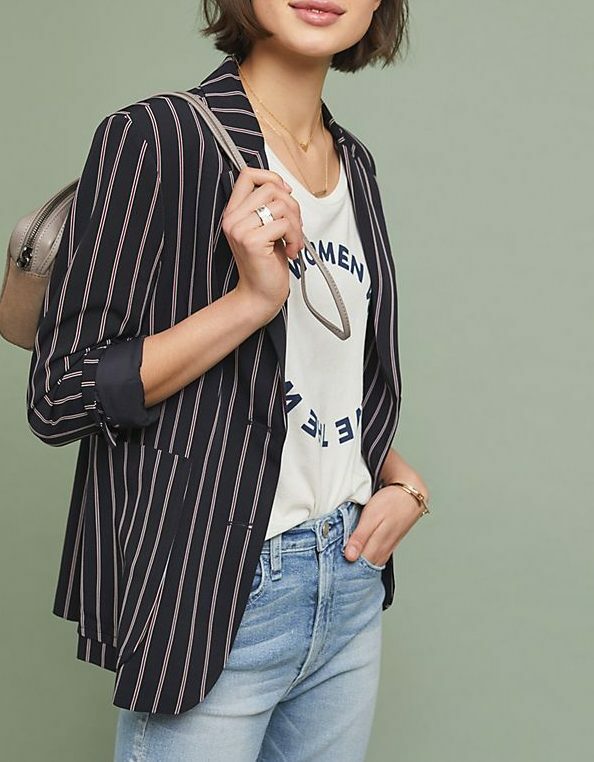 I could see wearing this breezy linen shirtdress (the stripes are there; they’re just eensy) constantly once it’s hot out. This excellently loud skirt has a touch of metallic woven into the fabric, which is fun. 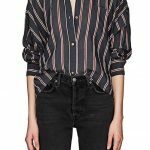 A blue-on-blue striped button-down that can be dressed way up or down. 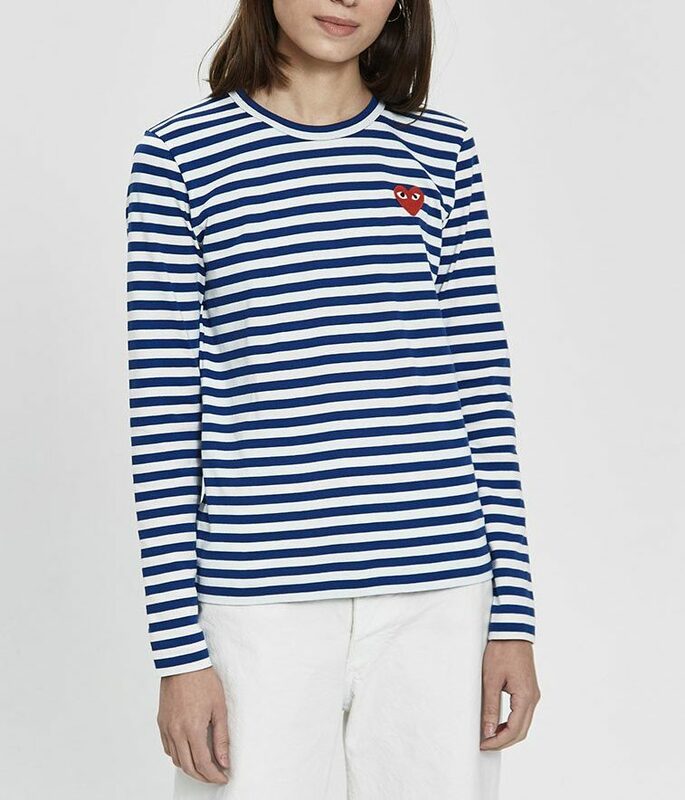 And of course, who can ever resist the adorable Play Comme des Garcons heart on this long-sleeved tee? It would be impossible to wear these sandals and remain in a bad mood. 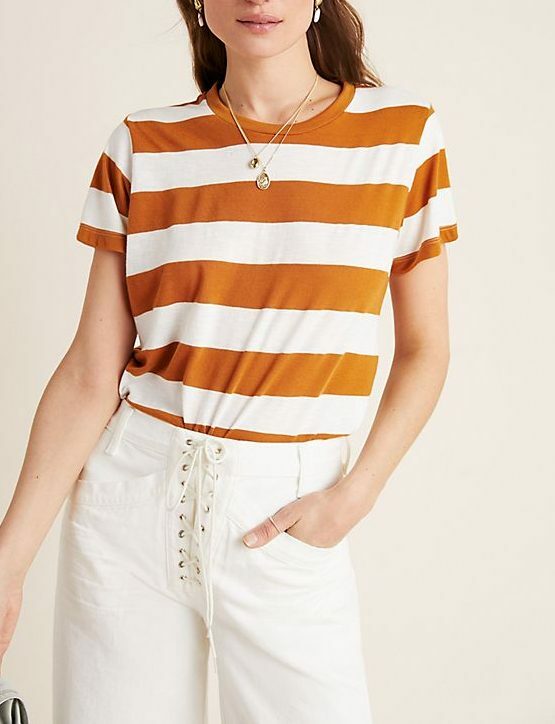 The burnt orange on this tee reminds me of the University of Texas colors, which I’ve liked since I was a kid, and I always like a really fat stripe—so tomboy chic. 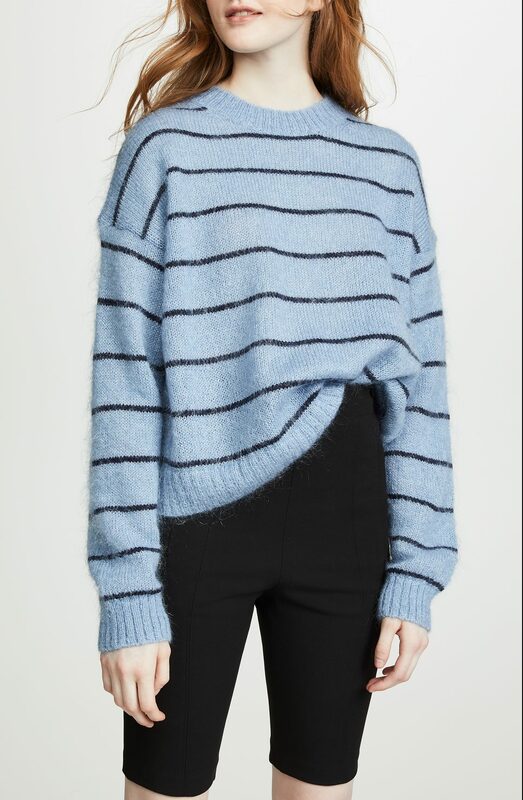 A cute and casual sweater, perfect for kicking around. And finally: these jeans are so fabulously new wave 80s that I had to include them. Such a great stripey round-up. The silk stripe is gorgeous. 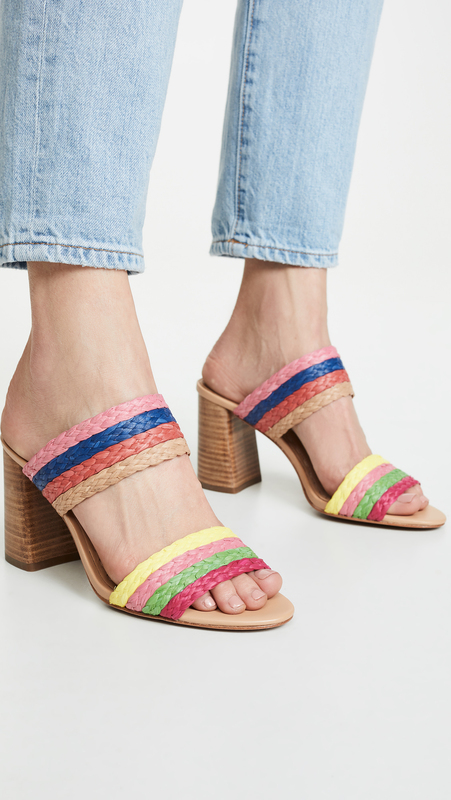 I just did a major shoe review/purge & delightly found a pair of striped wedges, colors similar to the pair shown here. 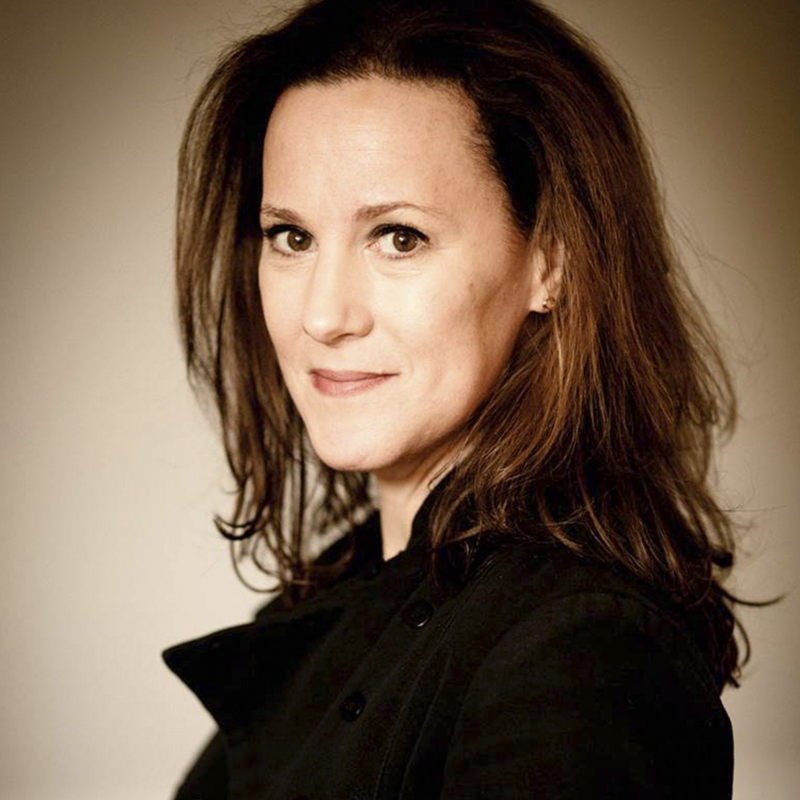 i love that stripey blazer – especially they way it’s styled there. but what’s really calling my name is that faded striped shirt. 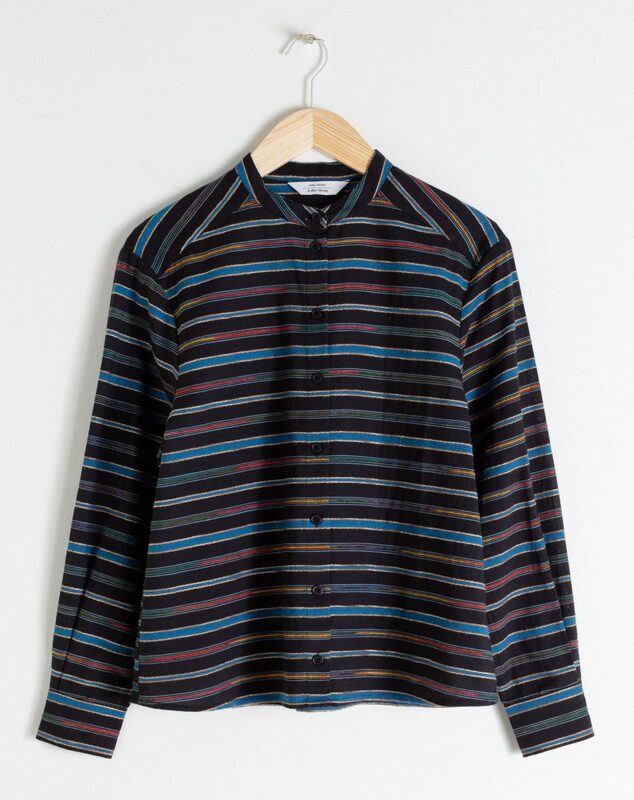 I remember those gauzey shirts from the 70’s in sherbet colors. my dad wore one, it looked great w/ a tan. just clicked through – a little pricier now eh? 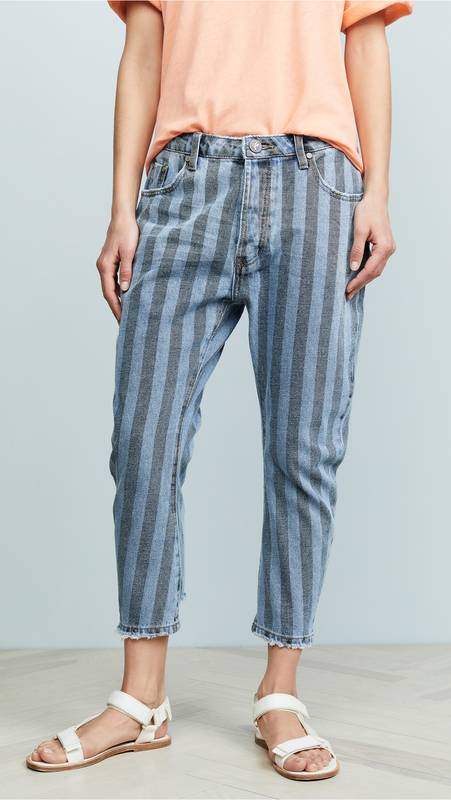 Waking up to a massive 80s flashback: I wore those vertical stripe jeans listening to Blondie and eurythmics in rural New Hampshire. Let’s just say, neither the music or the clothes were the dominant fashion paradigm of my town.